You probably have been to some Southeast Asian countries like Thailand, Cambodia, Singapore, Indonesia, and Malaysia. I mean why not? They are popular, beautiful and easy to hop into from your country thanks to numerous direct flights or easy connections. But what about the Philippines? It’s probably has been on your bucket list for like forever now but you are still hesitant because of the negative news you hear about it. Or you’ve probably heard about it and saw too many gorgeous pictures on the internet and has been planning for a while but you are still confused as to where to go because there are more than 7000 islands to choose from. I get it. It is overwhelming but you still need to go and visit for a lot of compelling reasons. The Philippines is beautiful, Filipinos are friendly and easy to talk to because they speak good English. Culturally speaking, the Philippines is more western which means there are no real culture nuances with the west unlike in Indonesia and some parts of Thailand where you always need to consider how you dress and how you talk to people. Most importantly, the Philippines has some of the best beaches in the world which is what probably got you here, on this page, in the first place. To help you with your planning, I came up with a list of really gorgeous destinations that will challenge your inner wanderlust. So whether you love adventures, off-the-beaten paths, idyllic beaches or a sense of mystery, this list will not disappoint. And if you’re looking for more travel tips or budget flight ideas, then be sure to subscribe so you never miss a post. A lot of people from the west always say that the Philippines is not as colorful as Thailand when it comes to cultural aspects. I’d say, probably because they have never looked close enough to notice real Filipino culture. Yes, Thailand has temples and Buddha statues everywhere but religion is only a tiny speck of culture. The Philippines has tons of superstitions and local expressions (too many that a year of studies is not enough for them), our way of life in itself is far from the west (sadly, tourists only see fast foods and foreign brands on our streets) and we speak numerous different languages other than English. In line with cultural backgrounds, if you really want to experience authentic Filipino tribal culture without having to look hard enough, you must go to the Mountain Provinces. Not only will you be able to see extremely beautiful landscapes, but you also get to see the tribal villages of Ifugao and Benguet. These tribal villages are the people behind the majestic Banaue Rice Terraces and the UNESCO Heritage Site of Batad Rice Terraces (considered to be the 8th wonder of the world). Here, you can immerse yourself into the local community lifestyle, hear local music, get a nice tattoo from the oldest tattoo artist in the world using nothing but charcoal and lime prick, and sleep in local Ifugao huts. The third smallest province in the country but is highly popular nonetheless, Siquijor is the island of mystic and wonders. For many years in the past, local tourists never ventured to Siquijor because the island was known to be inhabited by ghosts and witches. In fact, every year during Halloween, Siquijor’s Balete Drive is always among the most haunted list. Many believe that there is a white lady inhabiting the century-old balete tree and apparently it has already claimed many lives. At present though, Siquijor has grown past the mysticism and horror stories, in fact a lot of people believe, that those stories were meant to keep tourists away so the island can remain beautiful and pristine. Siquijor is small but it is packed with beautiful spots to explore. It has at least 3 waterfalls, beautiful white sandy beaches, and a couple of nice caves. You can also have a relaxing bath in one of these oversized woks similar to a witch’s boiling cauldron in kiddie fairy tale stories only this time, you are enjoying it to your heart’s content. Perhaps the most interesting story ever of a place is that of Culion Island in Palawan Province. Culion’s story is one of pain, isolation and triumph. In 1901 during the early years of American Occupation in the Philippines, the new American government established the Health Bill that would isolate Culion from the rest of the country for a hundred years. Culion was designated as a segregation colony in 1901 where people with leprosy are brought to avoid spreading the disease to the public. In 1906, after years of preparation, the first patients arrived – all 370 of them mostly from Cebu. Before the end of 1910, the patients increased from 370 to 5303. It peaked at the end of 1980 at 31,803 thereby making it the biggest leper colony in the world. It is only in the year 2006 that Culion was proclaimed leprosy-free by the World Health Organization (WHO). Today, Culion is on its long journey towards being one of the UNESCO World Heritage Sites. The local community is thriving and tourism is starting to grow. Culion is very similar to Coron and El Nido. It has pockets of white sandy beaches, healthy marine life and a wonderful story behind it. The second smallest island province in the Philippines and is popularly known as the “island born of fire”, Camiguin has the most number of volcanoes per square kilometer in the world. There are 4 volcanoes in the province which is why Camiguin is one of the most exciting places to see and one of the most beautiful as well. Aside from the volcanoes, Camiguin has a plethora of natural wonders like hot and cold springs, rejuvenating waterfalls, white sandbar, good beaches, and the sweetest lanzones in the world. If you love to explore history, Camiguin’s will leave you breathless. To see a bit of its history means to dive in its waters and explore what was once a capital city of the province – very similar to the stories of Atlantis – only this one is real. The capital city of Catarman along with its cemetery sunk 20 meters below sea level when Mount Vulcan came into being and erupted in 1871. Today, the area is marked by a huge cross standing in the middle of Camiguin Sea. Underneath the waters, you may see some old structures and graveyards but it is mostly that of a magical and colorful world of marine life. The most popular beach and definitely one of the most beautiful in the country, Boracay was closed down for rehabilitation for 6 months due to unregulated consequences related to the massive influx of tourists. It has since reopened with new stricter rules and limitations on the number of visitors and is more beautiful than ever. The island boasts of its 7km long white sand so white that it’s almost blinding. The soft sands are literally like powder and the turquoise blue waters are so calm and clear you’d wish that you become a mermaid for a day so you can stay in the water all day. 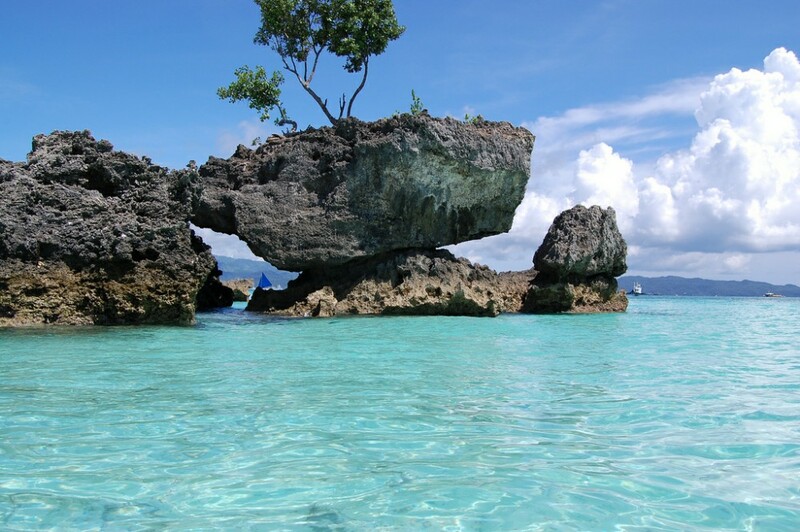 Boracay offers numerous hotels and resorts for fantastic deals, ranging from luxury to budget-friendly. Restaurants with varied menus and bars serving local and imported drinks are scattered all over the place. After sunset (the most spectacular sunset you’ll see), Boracay lights up and music starts to dominate the air with smoke coming from graceful fire dancers. If this is your idea of paradise, Boracay will certainly make it so difficult for you to leave. A province shrouded in mystery and enchantment, Surigao del Sur is still quite low on tourist’s radar for a reason that it is located in Mindanao (some areas in Mindanao are off-limits to tourists due to tribal wars). For those who are brave enough to visit, they are rewarded with beautiful and laid back scenery devoid of mass tourism. One of the most recommended spots to visit in Surigao del Sur is the Enchanted River. This river in the town of Hinatuan is believed to be inhabited and guarded by fairies. The river is very deep and yet you can see the bottom of it that’s how clear and clean the water is. At noontime, visitors are advised to get out of the water because it is feeding time for the fish – there are numerous fish in that river and local fishermen have tried to catch but no one was able to catch any. Aside from the enchanted river, tourists can also enjoy not one but 24 idyllic beaches scattered among the Britannia Group of Islands facing the Pacific Ocean. When you get tired of island-hopping, try to cool down in one of the most beautiful waterfalls in the country, the Tinuy-an waterfall. Sagada made national headlines in 2017 when a teenager fell to his death inside one of its caves resulting in indefinite closure to tourists. It has since been reopened and the tourism sector has now become more involved in the protection and safety of tourists and locals alike. Sagada offers tons of natural wonders and a kind of adventure that cannot be matched anywhere else in the country. The adventure that is borderline creepy, mysterious, breath-taking and awesome all at the same time. To start with, you can hike Kiltepan before sunrise and marvel at the sea of clouds perfect for self-reflection and wonder. Next, you can head to the waterfalls of Pongas, Bomod-ok or Bokong after a tremendous trek among the fields and rice terraces. The next morning, you can head out to see the hanging coffins of the Ifugao tribe on your way to the entrance of Lumiang Cave. If you want an ultimate adventure, I suggest you do the cave connection where you will enter Lumiang cave and exit through Sumaguing cave. Lumiang cave entrance is deep and you will be greeted with old coffins and bones of the dead. The caving adventure takes at least 4 hours and you must be accompanied by certified guides because I promise you, it is difficult. The cave is exhilarating and spectacular inside. You’ll end up with sore muscles the next morning but with a rejuvenated spirit. The most elusive destination in the Philippines is closer to Taiwan than the mainland Luzon. Batanes travel is not for everyone for it is very expensive although it is slowly changing now given that more and more local airlines try to ply the route from Manila and Clark airports. Batanes is not your usual Philippine scenery of calm turquoise waters, white sandy beach and concrete buildings. It looks more of an Irish coastal village with its rolling hills and stone houses. This northernmost province looks like it was frozen in time with its majestic cliffs, ancient culture, windswept seascape and roaring waves from the Pacific. Batanes is a seafood haven. Lobsters are incredibly cheap so you can feast on them all day without hurting your wallet. Weather is unpredictable. It can start sunny in the morning, then heavy downpour all of a sudden. Good thing is, if you wait 15 minutes or so, it will be sunny again. Best time to travel is between December to May when it is relatively dry and cool. Because of its location in the Pacific, Batanes is constantly along the typhoon path. If you’re planning your Philippines vacation, then be sure to check these areas out. You don’t want to miss everything this beautiful country has to offer, especially if you’re traveling abroad to make this exciting adventure come to life.